You will always leave a happy customer when shopping at Just Riding Along, 48 Mechanic Street, Bradford, Pennsylvania. 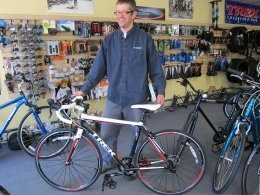 Owner Pete Dzirkalis and staff can answer any question you have on new products, get you outfitted with the proper gear, and keep you and your bike tuned-up and working for years to come. Ride with locals: Just Riding Along leads a bike ride every Tuesday and Thursday from the shop in Bradford at 6:00 pm. They ride 20 – 40 miles on Thursdays. Seasonal Hours – closed Christmas through mid-March.